Here is the house you've been waiting for! This beautifully updated home, (See Listed Updates) has everything you want & more. The cook's kitchen is large and upgraded with 42" staggered custom cabinetry with crown & rope detail, dual wall oven's, true hard wood flooring, stone back-splash, oversize planning/desk area, breakfast room and walk in pantry. Relax in front of either of the two main floor fireplaces both featuring a brick or stone surround. Second floor offers 4 additional bedrooms that are all generously sized and all have there own bathroom w/private vanity area. Master suite features tray ceiling & bathroom that's a spa retreat with oversize tub, shower w/tile surround & dual vanities. Step outside onto the huge maintenance free deck w/built in lighting that overlooks the expansive backyard which backs to trees & common ground. Also a stamped concrete path which connects the garage to the backyard for entertaining. 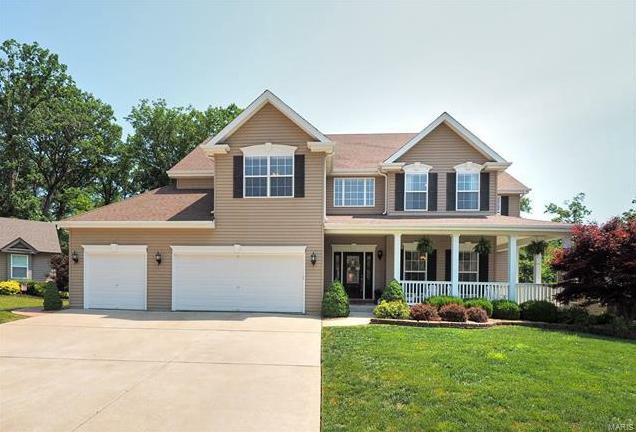 45 Hampton Park Court (MLS #18047008) is a 1.5 story single family home located in Wentzville, MO. This single family home is 3,435 sqft and on a lot of 15,246 sqft (or 0.35 acres) with 5 bedrooms, 4 baths and is 12 years old. This property was listed on 06/15/2018 and has been priced for sale at $399,900. The 5 bedroom single family home at 121 Cypress Meadows Drive in Wentzville is comparable and sold for $495,000 on 07/23/2018. Nearby zip codes are 63348, 63365, 63368, 63376 and 63885. This property neighbors other cities such as Foristell and Lake St Louis.